IMPORTANT! The photos of the Fireglo Model 360F will only serve as a reference and is not to be taken for a "before/after" series of photos. These photos will only show the possible look of the Mystery Unfinished Rickenbacker 360F when dressed up and ready. This is a late'50's / early '60s Rickenbacker 360-F (from the Thin-Full Body Series) which was never completed. It has never been painted, and has no hardware. The only two holes drilled onto the face of the body are for the wire to the neck pickup (about 1/4") and an identical hole where the ground wire would touch the bridge base. There are pencil marks where the bridge would be mounted, and a small hole drilled where the tailpiece's strap peg would go (but none for the other strap peg). The wood on this guitar is very, very nice, as you can see from the photos (especially on the neck; just think of how that flame will look when lacquered!). 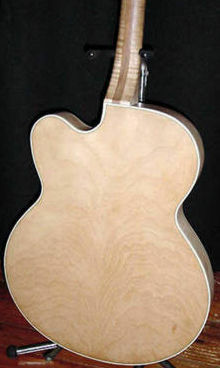 The back of the body is bookmatched; this guitar should, if painted, have a translucent finish. 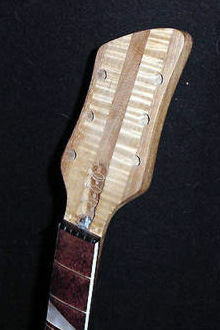 There is checkerboard binding on the front and the back of the body, which looks great, and the neck is also bound (a small piece has broken off of the bass side of the neck close to where the neck meets the body, see photo above). 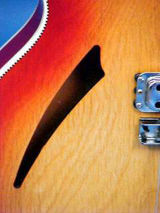 The neck inlays are typical triangle chips, not the "crushed" version found on post-'64 360 models. I am the third owner of this guitar. The second owner bought it ten or so years ago with the intention of completing it, and never got around to it. The original owner (who lived somewhere around Tucson, Arizona, I believe) claimed that his father had worked for Rickenbacker in the late '50s / early '60s and brought this guitar home. Why it was never finished is anybody's guess. The second owner had begun to install some parts, so there are holes drilled on the back of the headstock for Kluson-style tuning machines and a Rickenbacker logo (not included), and a nut has been installed. Also, there is a jackplate installed; it is a modern replacement Ric double-jack with a generic Ric serial stamp (although these guitars were not stereo, remember that the jackplates on Ricks of this period were long enough for two jacks, see photos of Lennon's late-'50s 325). In spite of the presence of a jackplate, this guitar was certainly never wired up, as there are no holes drilled to install pickups or a bridge. Unfortunately, I don't have any way to document anything about this guitar; but the story checks out, as far as I'm concerned. The fact that there are no holes drilled on the body for a pickguard, or for pickups, is evidence enough to me that this is no shop class project. This must be the only existing example of its kind (in its unfinished state) in the world today, with the possible exception of examples within the Rickenbacker vaults.